Apple's stockpile of cash and reserves grew another $16 billion in the holiday quarter, reaching $97.6 billion, as executives hinted they are considering big plans with their money, even though they aren't in a hurry to spend it. 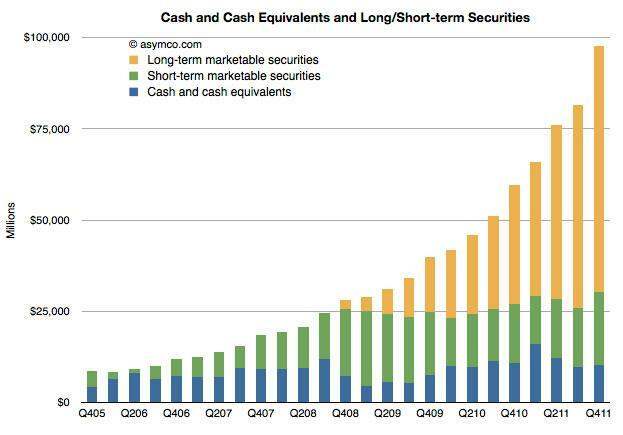 The tenth of a trillion dollars in cash held by Apple was up from the $81.6 billion the company had amassed at the end of its September quarter. On Tuesday's quarterly earnings conference call, Apple Chief Financial Officer Peter Oppenheimer addressed the issue before analysts could even ask about it during the open question-and-answer session. "We're actively discussing uses of our cash balance, and have no specifics to share," Oppenheimer said. "In the meantime, we continue to be disciplined with cash, and are not letting it burn a hole in our pockets." The massive sum accrued over the holidays means Apple added a total of $38 billion to its short-term and long-term marketable securities in the last calendar year, Of the nearly $100 billion Apple has in cash, about $64 billion of it was being held offshore at the end of the quarter, Oppenheimer said. "We have always discussed, internally with the management team and with our board, our cash," he said. "We recognize that the cash is growing for all of the right reasons. And I would characterize our discussions today as actiive as what makes the most sense to do." Oppenheimer was then asked by Bernstein Research analyst Toni Sacconaghi whether there is a timeframe for using the cash or when Apple might reveal details to investors. "When we have something to announce, Tony, we will announce it," Oppenheimer said. "But I want to say again, we are actively discussing the best uses of our cash balance." One relatively small use of Apple's cash came last quarter, when the company bought flash memory maker Anobit for a rumored price of $400 million. Apple Chief Executive Tim Cook confirmed and spoke about that strategic acquisition on Tuesday, stating: "Anobit has fantastic technical talent. We're really fortunate to have them join us."